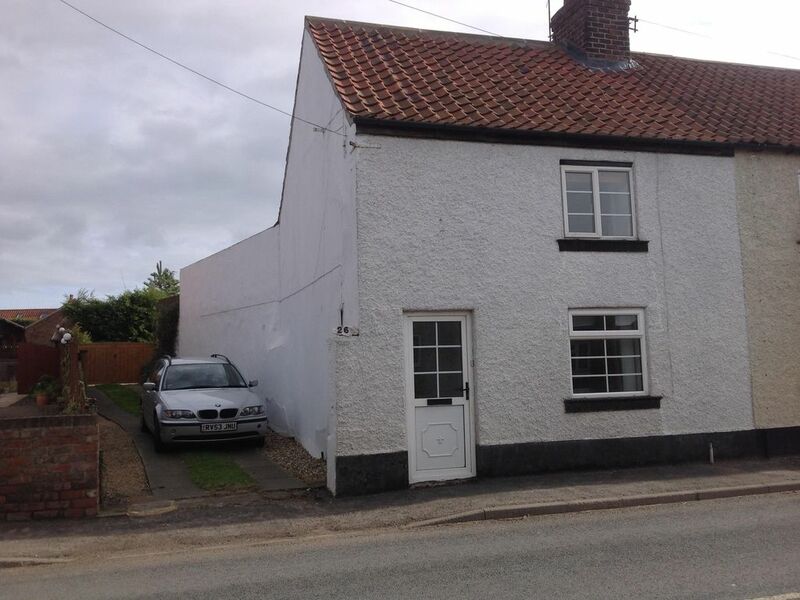 Pet friendly ,two double bedroom cottage,private garden , two car parking . Cottage with stone walls modernised sympathetically to retain its character . Two double bedrooms with double beds one with comfortable foldaway single bed suitable for a child . Modern fitted kitchen , down stairs bathroom with shower . Wood burning stove and electric heating , gas fire in lounge . Two car parking in driveway, private rear courtyard area and beautiful large garden with furniture and barbecue . Original cottage style staircase to the bedrooms . Pet friendly for up to two well behaved dogs . In area of natural beauty , scenic coastal walks .Only 3 miles from Bridlington a great British seaside resort . Filey ,Scarborough and Whitby a short trip up the coast . Historic fishing village Flamborough has all the amenities needed for a good Holiday . Paul and family live in the Midlands , love to be by the coast and use the cottage for stress free relaxing Holidays. Welcoming happy atmosphere in the cottage .In an area of unspoilt natural beauty . Great place to relax and just chill ! Fabulous walks on unspoilt Flamborough Head coastal path or to Danes Dyke . All amenities shops,pubs ,cafes,and takeaways within a few minutes walk ,no need to drive . Great base to take a short trip to Filey ,Scarborough or Whitby along the coast . Stone walls and quirky character to the loveable place . Large private garden . White bathroom ,with a large size bath shower over the bath . Constant gas heated hot water . Electric heaters in all rooms . No Internet connection. Good mobile phone signal. Bed linen provided , advise owner if single bed is required . Washing machine in outhouse ,in the courtyard . Open flame gas fire in the lounge. Two car parking in cottage driveway . Towels provided in each bedroom ,and set in the bathroom. Solid fuel burner in snug room . Two seater sofa ,armchair and rocker chair in the lounge,flat screen TV/DVD player . Two seater sofa and two small armchairs in the snug room . Portable CD player . DAB radio . Fridge in the kitchen , freezer in the outhouse just outside the kitchen. Full sets of dishes ,pots ,pans and cooking utensils . Table in dining room extends to seat four . TV /DVD combination in lounge. Portable CD player, DAB radio . DVD player combined with TV . Selection of interesting books . Various board games in cupboard in the lounge . Courtyard and large well maintained private garden , outdoor furniture with cushions. Steep staircase and single step up to the kitchen and bathroom . Stunningly beautiful coastal walks with inspiring views of Flamborough Head . Bridlington ,Filey and Scarborough all in easy reach. Friendly historic fishing village,with great pubs,village shops , cafes and takeaways all within a few minutes walk . Unspoilt Flamborough beaches 15 minutes walk away. Great British seaside resort Bridlington with fabulous beaches and entertainment only 3 miles away .